Of all the patterns I have tried and all of the creatures I have freehanded, the Weebee pattern by Laura Tegg is a solid favorite of mine which I keep coming back to because it is so simple and versatile. Cute crochet doll patterns with coordinating clothing and accessories is one of those wonderful ideas that I really wish I’d come up with myself. Unfortunately I did not, however I do like using the Weebee patterns as a jumping off point for my own adaptations and that’s a huge part of their versatile appeal for me. Another reason why these patterns are so attractive to me is that there are a LOT of different options provided by their creator and they are very well written linking to technique videos to support even the most beginner level crafter. It’s also probably important to note that… The doll patterns are completely free as well as many of the clothing patterns! Even the paid patterns are reasonably priced. Anyway. Enough of me rambling about patterns. Below I’ll show off all of my dolls below in chronological order as a sort of Weebee progression gallery, and I’ve included links to all of the patterns as well as any notes regarding their composition. Each Weebee I’ve made so far has taken me between 2-5 days to make. I crochet pretty quickly but two little girls and carpal tunnel in both hands slows me down a fair bit. I’ll also update the post as I create more! This was my very first Weebee. I only had 12mm safety eyes and thought that her head was far too large to pull them off, so I tried my hand at crochet eyes with the help of a Youtube video, and they were a lot easier to make than they look! I’d planned to give her some super cute afro puff pigtails, but my 1 year old claimed her and I thought that she’d probably tear them apart, so that is why she doesn’t have fancy hair. She is wearing this dress pattern and the little Mary Jane shoes are from this pattern here. She has 12mm safety eyes and her tail is removable to reveal two little legs with formed feet inside. 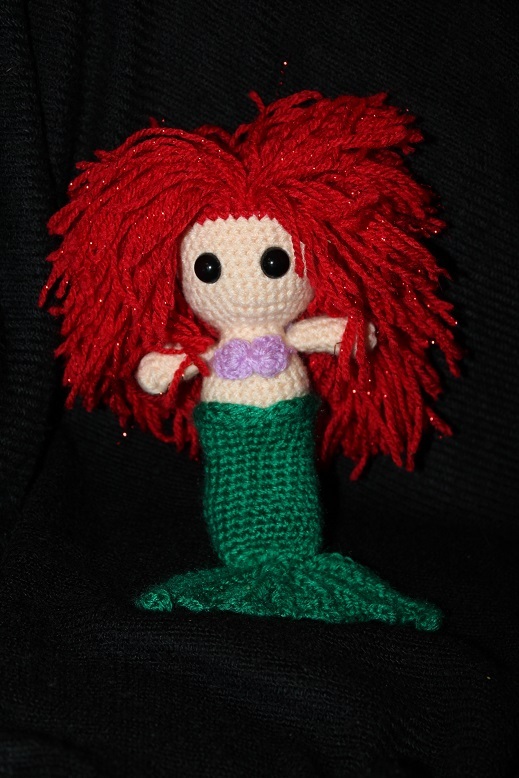 I freehanded both the seashell bra and the tail and intended to also make her a dress, but haven’t actually gotten around to that part as of yet. 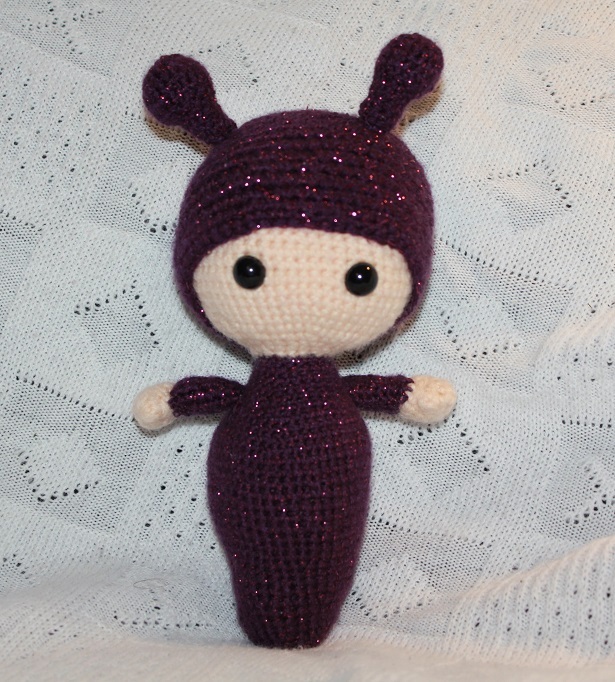 I love babies in footie jammies, so the my first Weebee bunny pattern is very appealing to me. It also means that I save a lot of time not having to make extra clothing. This doll features 15mm safety eyes which I think suit the size of her head much better than the 12mm ones would. I also prefer safety eyes to crochet ones as they are glossy and they sort of look more alive to me. I freehanded the owl face on the pattern’s hat and sewed in the button eyes and pom pom ear tufts. To avoid having an absolute ton of hair, I only hooked in roughly two rows all around her head and then I sewed the hat onto her head so that it’s not removable. My original plan was to cut her hair to waist length, but I ended up really liking it long. This doll is currently put away to give to one of my daughters when she is older. I haven’t decided which one yet. I followed the pattern almost exactly except I added the little ear flaps to the side to make her hat look more like Louise’s hat. 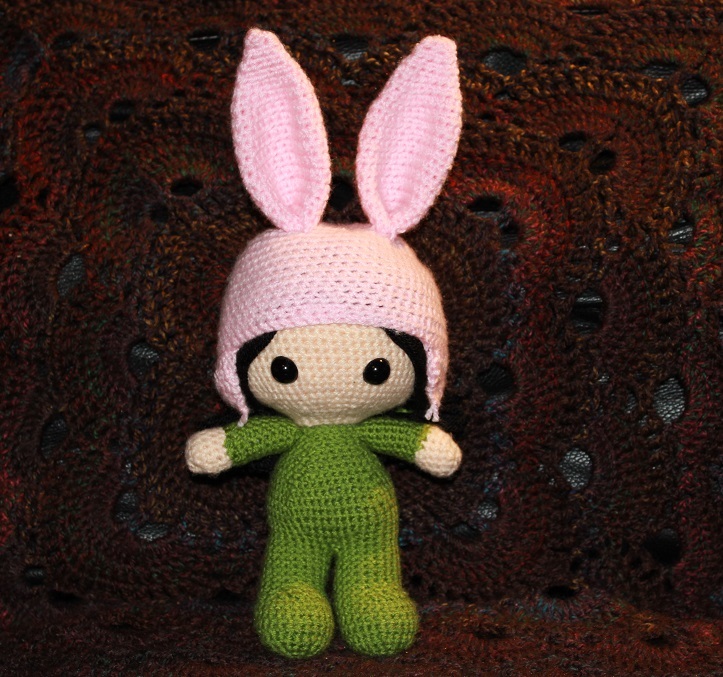 She also has 15mm safety eyes and I only did two rows of hair with the hat sewn onto the head as well. her hair is then joined in pigtails behind her head to look more like Louise. In winter 2017 someone got the fabulous idea to use white yarn to make a Weebee snowman, and posted it to the Weebee Appreciation Society, Facebook group. 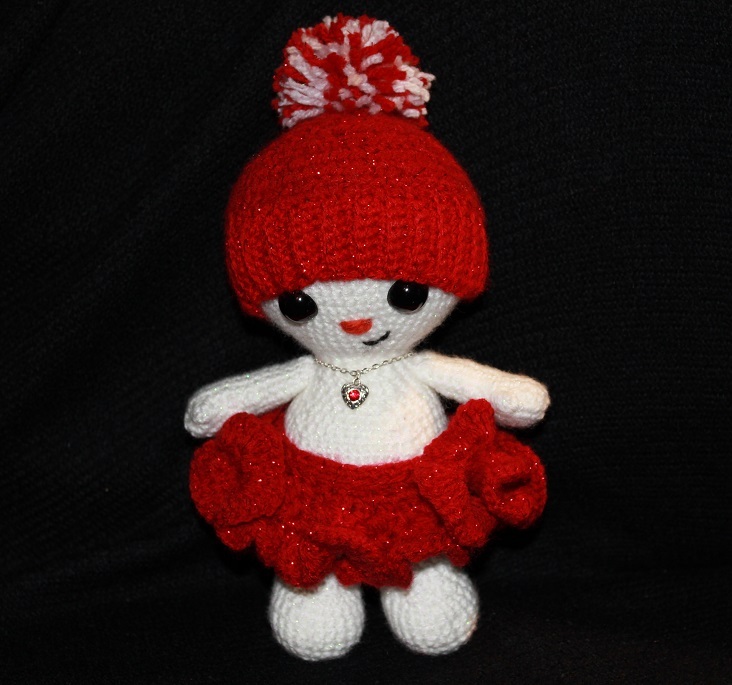 Shortly afterward Laura released an official free pattern which included a bunch of adorable, removable snowman accessories (which will also fit any other standard Weebee doll). I had some white sparkle yarn to try and I needed to make a christmas present for my auntie in the United States, so I put this little guy together. He also has 15mm safety eyes and his hat, and gloves can be removed. The pattern also includes adorable little boots, but after I made them I decided that they didn’t really suit my snowman, so I left them off. I decided not to make the gloves, boots or scarf as they didn’t really suit her. However as a finishing touch I made her a little heart necklace with a matching rhinestone. The yarn I used has a greenish iridescent sparkle thread to it which doesn’t photograph well, but looks awesome in person. 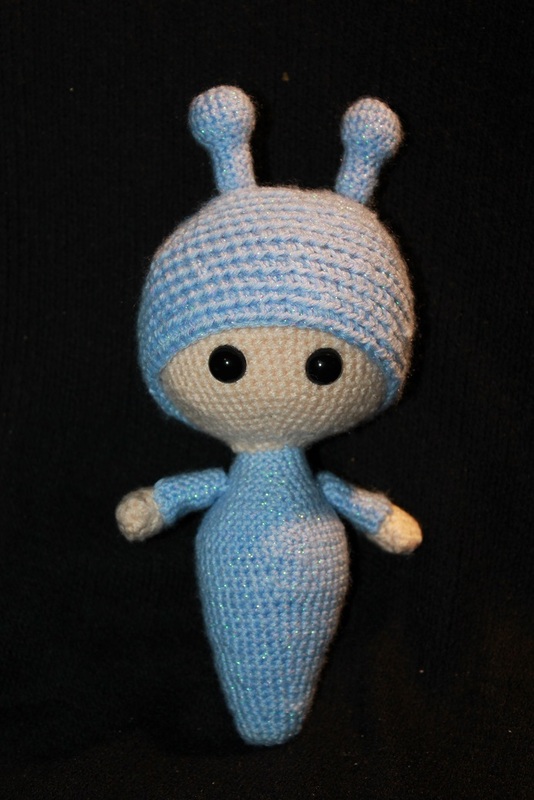 This is another variation of the my first weebee pattern. Instead of making legs I freehanded the tapered tail up to the waist (then followed the pattern for the rest of the body) and instead of adding bunny ears to the hat, I freehanded a couple of antennae. I did write down the stitch counts to modify the legs and for the antennae… If anyone actually wants the patterns, just let me know, otherwise it’s not really worth typing them out right now! Not sure what I am going to do with this doll yet. This is another caterpillar slug baby made with purple sparkle yarn. She was supposed to have brown skin, but when it came time to do the head, I couldn’t find the brown yarn that I wanted to use so I think that I will make a third now with brown skin. This doll is also currently homeless. Made with 12mm safety eyes again. Though the one I keep forgetting to get a photo of has 15mm safty eyes and they do look great!